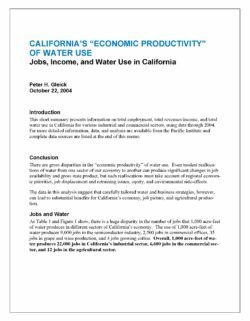 This short summary presents information on total employment, total revenues/income, and total water use in California for various industrial and commercial sectors, using data through 2004. Far more detailed information, data, and analysis are available from the Pacific Institute and complete data sources are listed at the end of this memo. There are gross disparities in the “economic productivity” of water use. Even modest reallocations of water from one sector of our economy to another can produce significant changes in job availability and gross state product, but such reallocations must take account of regional economic priorities, job displacement and retraining issues, equity, and environmental side-effects. The data in this analysis suggest that carefully tailored water and business strategies, however, can lead to substantial benefits for California’s economy, job picture, and agricultural production. 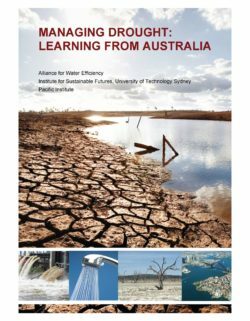 Overall, Australia survived the Millennium Drought, demonstrating world leading innovation and exceptional examples of water planning and management driven by crisis. Yet there are also examples of missed opportunities, as well as initiatives and decisions that did not work well. The research presented here reflects on some of the key lessons from the Australian Millennium Drought experience in order to assess the opportunities for California. This report serves as a powerful resource for Californian water planners and managers as it grapples with drought and seeks to build resilient and sustainable water systems. It provides a one-stop shop overview of the key events and initiatives implemented in Australia’s four largest cities – Sydney, Melbourne, Brisbane (and the surrounding south east Queensland region), and Perth. The work represents one interpretation of the drought and responses, informed by significant engagement with utilities and governments throughout that period, and a close working knowledge of the water systems and the policy environment. Specific attention is given to the role of demand-side measures in reducing the impact of drought. In Australia, urban water efficiency was the quiet achiever – saving more water at lower cost and greater speed than supply options. California can benefit from long-term structural water savings by implementing water efficiency measures at a similar breadth and scale. 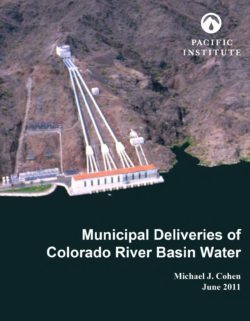 The Pacific Institute’s Municipal Deliveries of Colorado River Basin Water documents population and water delivery information and trends for 100 cities and agencies that deliver water from the Colorado River basin. Since 1990, the number of people in the United States and Mexico who use Colorado River basin water has increased by more than 10 million -– but their overall per capita water use declined by an average of at least one percent per year from 1990 to 2008. The new report provides -– for the first time -– real numbers on the extraordinary population growth among cities that depend on water from the basin and on changing water delivery rates by these cities. Author Michael Cohen, senior research associate, documents the substantial water-efficiency gains made over the past twenty years by agencies delivering water from the Colorado River basin -– even by agencies and cities such as Flagstaff that already had relatively low per capita delivery rates in 1990.